IDC sees widespread adoption of cognitive systems and artificial intelligence (AI) across a broad range of industries will drive worldwide revenues from nearly $8.0 billion in 2016 to more than $47 billion in 2020. 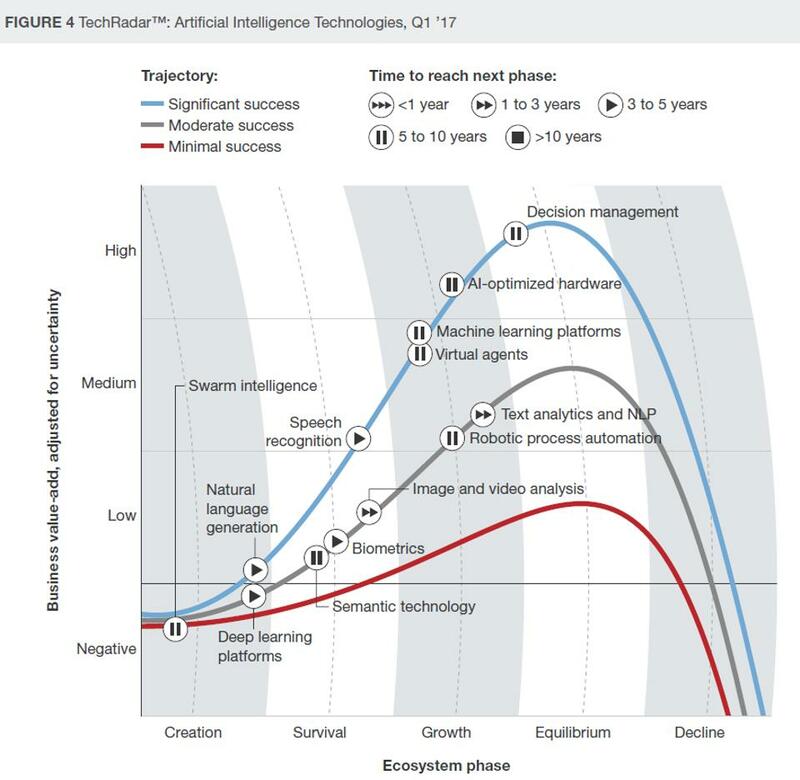 According to a new Worldwide Semiannual Cognitive/Artificial Intelligence Systems Spending Guide from International Data Corporation (IDC), the market for cognitive/AI solutions will experience a compound annual growth rate (CAGR) of 55.1% over the 2016-2020 forecast period. 2. Speech Recognition: Transcribe and transform human speech into format useful for computer applications. Currently used in interactive voice response systems and mobile applications. Sample vendors: NICE, Nuance Communications, OpenText, Verint Systems. 3. Virtual Agents: “The current darling of the media,” says Forrester (like Amazon Alexa), from simple chatbots to advanced systems that can network with humans. Currently used in customer service and support and as a smart home manager. Sample vendors: Amazon, Apple, Artificial Solutions, Assist AI, Creative Virtual, Google, IBM, IPsoft, Microsoft, Satisfi. 6. Decision Management: Engines that insert rules and logic into AI systems and used for initial setup/training and ongoing maintenance and tuning. 7. Deep Learning Platforms: Currently primarily used in pattern recognition and classification applications supported by very large data sets. Sample vendors: Deep Instinct, Ersatz Labs, Fluid AI, MathWorks, Peltarion, Saffron Technology, Sentient Technologies. Deep Instinct is the first to apply deep learning to cybersecurity. They claim superior zero day attack production for endpoints and mobile devices. Mumbai-based Fluid AI was founded in 2008, by two brothers Abhinav Aggarwal and Raghav Aggarwal, with a belief that the power of artificial intelligence can be used across industries, sectors and use cases. They have about a staff of 50 now. Fluid AI offers machine learning driven decision making for various business operations, and on the other it is creating virtual customer assistance for firms with a physical presence. “The AI technology uses genetically evolving neural networks to create over 100,000 iterative models from the data sources given to us by the clients. It studies the data pattern which arises from the model evolves accordingly and improves feedbacks whenever the market conditions change.” says Abhinav. The company offers a Plug and Play artificial intelligence system, which can be installed in any system. It connects to hundreds of data sources within and outside the server and gives the suggestions based on the previously collected data.